Good news: Delta Airlines just announced that they’ll be serving up a variety of craft beers on many of their flights! Many of the breweries involved are widely known like Stone, Lagunitas, Brooklyn Brewery, and Ballast Point, while others (looking at you Newburyport and Blue Point) are beers with smaller regional followings. Got all that? This passage makes up almost half the text in the press release, so you know they thought it was important to share, even if it’s almost impossible to parse. Thankfully, they also created the image you see above that lays out which beers are available on which routes in a fairly simple way. Unfortunately, they’ve made the image and text so small that it’s almost impossible to read. 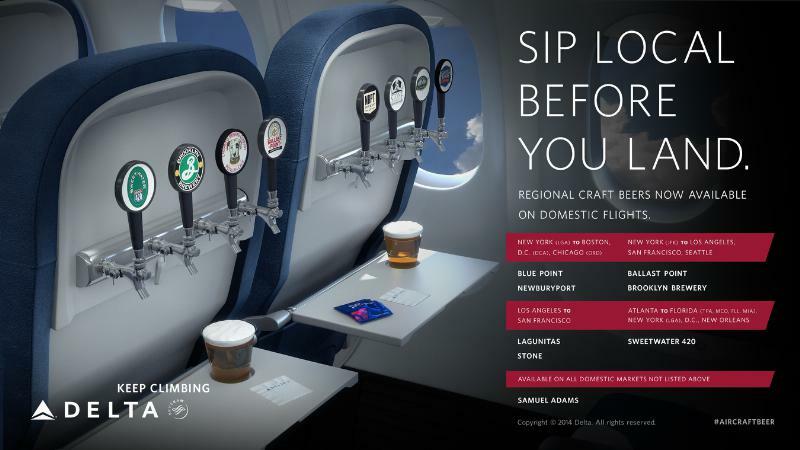 Even at the largest size provided by the airline, the image of their overly complicated regional craft beer offerings is a poorly conceived blur of maddening missteps. Maybe they should do what other airlines have done – offer up a selection of craft beers from the city where they’re headquartered. Frontier does this with Colorado beers, and Sun Country Air out of Minneapolis offers brews from Surly on their flights. Then again, Delta is headquartered in Atlanta, so maybe they don’t have a lot of local breweries to choose from. There’s Sweetwater (whose 420 is being served on certain Atlanta-based flights) and…uh…Terrapin? At any rate, it’s nice to see them try, and it’d be great to have the option of drinking a Ballast Point Sculpin IPA on the way to San Diego. I just wish they weren’t so “airline-y” about the whole thing. Tip of the hat to none other than Brother Don for posting this news to Facebook – now I wish he’d post something here! Kudos to Delta for serving beer with that same dedication to reliable service that they provide their passengers. I refuse to provide my business to the airlines until such time as they go back to a stakeholder model of Capitalism. The which, at my age, probably means the rest of my life. Hope you have comfortable shoes! Everything I’ve had from Terrapin has been too “gentle” for me, which makes it right up you alley. That seat with the taps would be awesome until the guy in front of you reclined. Especially if you had your laptop open and jerkface in front of you whips his seat back without first giving a little warning tilt. I’ve almost had my screen pinched and split more than once! Georgia laws are not the best. However, some sites show Strawn Brewerey, BurntHickory,5 Season Brewpub,EvenTide Brewing, Monday Night Brewing, Wrecking Bar Brewpub, Sweetwater, Jailhouse Brewing and maybe a few others in and around Atlanta. And maybe a few other brew pubs. I think the issue is that no one’s likely heard of any of these small Georgia breweries, so the gesture of offering cool craft beers would largely be lost on most passengers. You aren’t saying that travelers need to know the brewery for it to be considered worthy of being considered? Since the effort is to provide regional items then, by definition, lots of folks outside the area won’t know the products. I have a sneaking suspicion there are some “advertising dollars” being thrown around. I’d like to see them rotate selections around and not just zero in on the largest in the region. Sweetwater is the largest regional brewery in Georgia but lots of others, many of them new and making exciting stuff, are canning their beers and deserve a shot at getting the exposure. I suspect the smaller breweries do not bottle or can their beer. The only way to buy their stuff is to go to the brewery. I suppose the attendants could strap the kegs to their backs as is done at baseball stadiums in Japan. Actually, many of the newest ones here in Georgia are canning. I applaud the decline of bottles myself. I’m a “can man”. There are loads of canned and bottled GA beers, in addition to the ones Micheal listed, Three Taverns, Red Hare, Orpheus, Creature Comforts, and Wild Heaven. Plus more that are going to be bottling soon, like Blue Tarp. And for my part, I’m far more excited about a beer that I’ve never heard of than Stone, Languinitas, or the like. You could probably answer this if Delta’s announcement had a large enough font: Does this mean they are carrying bottles on board or are these breweries all using cans now?